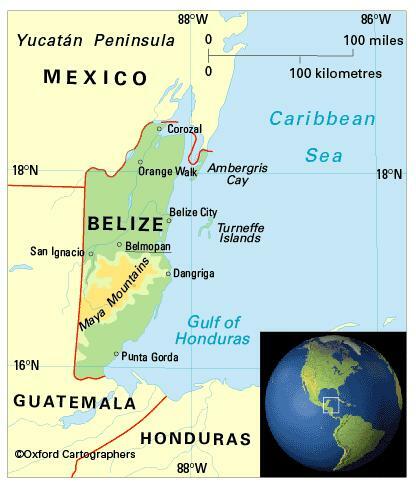 Belize forms part of the Commonwealth Caribbean and is located in central America, bordering Mexico to the north and Guatemala to the west and south. The climate is subtropical, moderated by trade winds. The average temperature from November to January is 24°C and from May to September 27°C; inland there is a greater range. There are two dry seasons: March-May and August-September (the Maugre season). Annual rainfall ranges from 1,290 mm in the north to 4,450 mm in the south. The country is susceptible to hurricanes; Hurricane Iris in October 2001 – the fourth in three years – was the worst for 40 years. Several years later in August 2007 another hurricane, Hurricane Dean, hit Belize affecting the livelihoods of up to 2,500 families in the northern parts of the country. The most significant environmental issues are deforestation; water pollution from sewage, industrial effluents and agricultural run-off; and solid waste disposal. 324,000 (2012); 45 per cent of people live in urban areas. The population growth rate was 2.5 per cent p.a. between the years of 1990 and 2012. In 2012 the birth rate was 24 per 1,000 people (40 in 1970) and life expectancy was 74 years (66 in 1970). Belizeans descend from Mayans, Caribs and the many groups who came as loggers, settlers, refugees, slaves and imported labour: English, Spanish, Africans and East Indians. According to the 2000 census, the population comprises 49 per cent Mestizos (Maya-Spanish), 25 per cent Creoles (Afro-European), 11 per cent Mayans and six per cent Garifuna (Afro-Carib). There is a small Mennonite farming community who speak a dialect of German and a fast-growing Chinese community. Belize is classified as a lower-middle-income economy by the World Bank.